Here are some less well known kinds of insurance you might want to consider. Even though there is not much risk of a big quake here in Iowa, I once added earthquake coverage to my homeowners policy. At the time I lived in an old, two-story farmhouse that I thought would be susceptible to an earthquake, and the cost of coverage was only a few dollars per year. It was well worth it for the peace of mind. In case of illness or injury, supplemental health insurance may cover deductibles and co-payments that are not covered by other forms of insurance. It may even provide a cash payment to cover expenses such as utility bills, housing payments, and groceries while you are not working. Plans typically cost up to $30 per month. If you are a victim of identity theft, this insurance policy will cover the expenses of restoring your identity, including application fees, postage, notary fees, and attorney fees. Some policies also provide fraud loss coverage in case funds are stolen from your account. Coverage costs between $25 and $50 per year. Unlike most other types of debt, student loans cannot be discharged through bankruptcy if you become disabled and are unable to make the payments. Some disability insurance providers offer student loan protection that can be added onto a disability policy that will make your student loan payments. This type of coverage is especially popular for medical school graduates and others with large student loans. A lot of the expensive things that can go wrong with a wedding are covered by wedding insurance. The wedding may need to be postponed due to illness or injury. The wedding dress, rings, and even the cake can be lost or damaged. Depending on coverage, wedding insurance typically costs a few hundred dollars and may be worth considering if you are planning an elaborate event for the big day. You can also get liability coverage to protect you in case an accident happens at the wedding. Dorm insurance covers expensive items that you might take with you to college, such as a computer. It typically has a very low deductible (around $25), which makes it easier to get a payout if you suffer a loss. A $5,000 policy may have a premium of around $140 a year, according to Consumer Reports. But your homeowners insurance policy may already provide some coverage for students living in dormitories, so check before you sign up. If you have a valuable collection of antiques, coins, stamps, fine wine, or anything else out of the ordinary, you might want to consider getting your collection appraised and getting insurance coverage to replace it in case of damage, theft, or destruction. 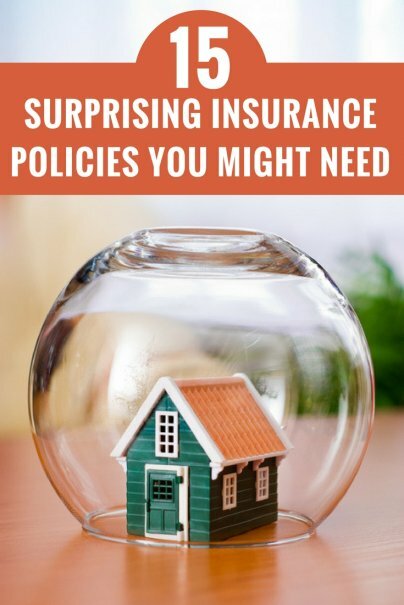 Standard homeowners insurance policies have limited coverage for special items, so adding a rider or separate policy may make sense. Premiums can vary widely depending on the appraised value of your items. One of the big variables in retirement planning is estimating your life span. Living for a long time increases the amount of funds you'll need in retirement. If you are worried about outliving your retirement savings, you can get longevity insurance, a type of deferred annuity, that starts paying out once you hit a certain age, such as 85. An important thing to note is longevity insurance is "use it or lose it" — if you die before collecting your benefit, the money is lost. Mortgage protection insurance pays off your mortgage in the event of your death, and covers your loan payments if you become disabled or lose your job. If you have life insurance and disability insurance, you may already be covered for this risk. Mortgage protection insurance can be a good option if you are in a high risk occupation and cannot easily get disability insurance. Premium costs vary but are typically several hundred dollars per year.